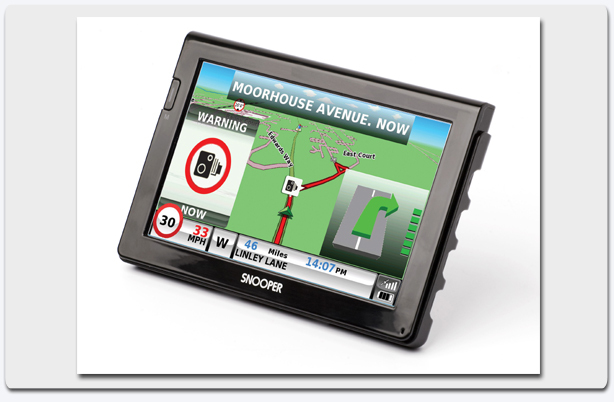 Snooper Ventura Pro S7000 – the best sat nav designed specifically for caravan and motorhome use just got better. Now includes Junction View, Lane Guidance and information on 20,000 campsite and motorhome stopovers in 31 countries! 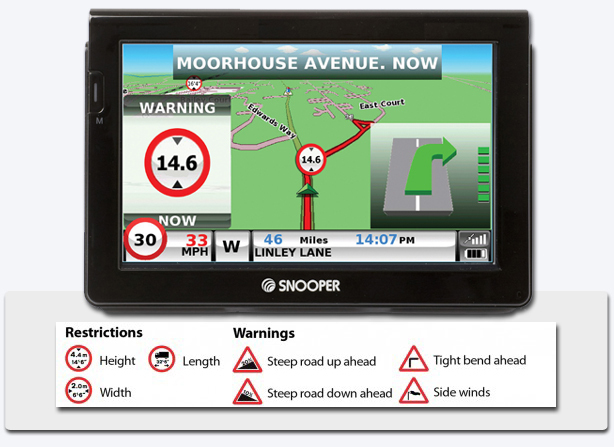 Snooper Ventura Pro is the first portable sat nav system to include dedicated routing designed specifically for caravans and motorhomes – plus Snooper’s multi award winning speed camera location technology. Ventura was first launched in 2009 and has been a huge success, welcomed by caravan and motorhome enthusiasts across Europe. Simply enter the height, width and weight of you vehicle and Ventura will automatically calculate a route avoiding low bridges, weight restrictions and many other hazards. The Ventura Pro S7000 sat nav system is the result of many months of development based on our research of the industry and feedback from 1000’s of caravan and motorhome users. As a result Ventura Pro is the most comprehensive portable sat nav system designed specifically for caravans and motorhomes on the market. Ventura Pro uses Navteq transport data at it’s core, but Ventura Pro is further enhanced but 1000’s more attributes combining to give far more comprehensive cover of hazards on more roads than any other system on the market. Snooper Ventura Pro S7000 incorporates a large 7” display. This large format display makes it much easier to view any potential hazards to your vehicle such as weight and height restrictions, plus it makes it possible to display all turn-by-turn routing instructions in a larger format making them much easier and safer to read whilst driving. Everything about Ventura Pro is bigger and better. It is easier to enter addresses and scroll through the systems menu with bigger on-screen buttons that are easier to press. Plus the S7000 incorporates FREE TMC traffic information, Bluetooth handsfree and DVB-T digital free to air television*. You can even attach a reversing camera! Special Offer – DVB-T external antenna worth £19.99 included FREE! Snooper Ventura Pro S7000 – What’s new? Now includes campsite and motorhome stopover information supplied by ACSI, BordAtlas and Camperstop! 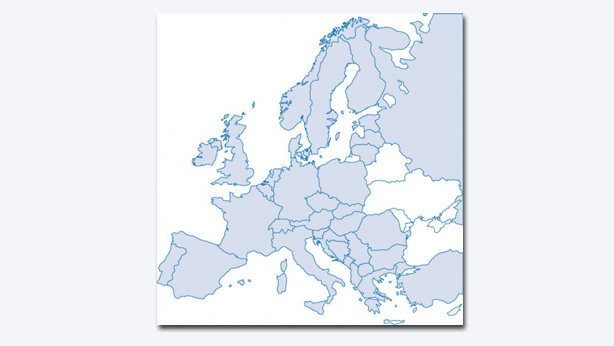 Select the facilities you require from the built-in ACSI, BordAtlas and CamperStop databases then search and navigate to one of 20,000 campsites and motorhome stopover sites across 31 countries across Europe. In many cases Ventura will even show you a photograph of your chosen campsite before you depart! Snooper Ventura now also comes with complete lists of Caravan Club campsites, Caravan Club Approved campsites plus The Camping & Caravanning Club campsites – all preloaded so that you can search and navigate straight to them at the touch of a button! Create and save your own bespoke routes. Use the map view to select the roads you would like to travel or search road by road, use ‘Your route’ to build your own personal, tailored routes. Point of interest ‘corridor’ search. Choose to search from our extensive list of Point’s of Interest using our new ‘corridor’ search facility. The ‘corridor’ search function enables you to search specifically along your pre-programmed route. The speed limit of nearly every road across Europe can now be clearly displayed on your Ventura Pro S7000 at all times. Choose between speed limits for cars and advisory speed limits for caravans and motorhomes. In addition, My Speed can also be set to alert you if you accidentally exceed the speed limit at any time. Search and navigate to motorway junction numbers using the updated ‘Find by map’ function including Junction numbers. Set Route timer to alert you when you need to take a break. Set the maximum driving time allowed and set the advanced warning time you require before your next break is due. The Route timer clock will keep you advised of the driving time you have left and will automatically alert you when it’s time to take a break. At Snooper we understand the difficulties of fast moving technologies. No sooner have you purchased a new PC or Television and it’s already out of date, that’s why we are offer free software updates! As Snooper’s Ventura technology get’s better and better you can keep up, knowing you have always got the most up to date unit on the market! Ventura comes with street level mapping of Western and Eastern Europe as standard. TMC Traffic information technology – FREE of charge! Traffic information is fed from 100’s of thousands of vehicles and sensors across Europe providing up to the second traffic information. If there is congestion on your route, simply ask Ventura to find a route around it. Over 2 million POI’s across Europe including ACSI, BordAtlas, Camperstop, Caravan Club and Caravan Club recommended sites plus The Camping & Caravanning Club sites preloaded as standard! To ensure the most accurate postcode search available Ventura uses Navteq’s 7 digit postcode search, the most comprehensive of it’s kind. THE AURA ADVANTAGE! – THE IMPORTANCE OF VERIFICATION – All databases are not created equal. Unlike AURA, many other GPS databases rely largely on locations provided by hobbyists who might not be able to tell a speed camera or a red light camera from a traffic flow camera or a surveillance camera. These databases could result in annoying false alerts, which could lead you to start ignoring even legitimate alerts–defeating the point of having a GPS database in the first place. The AURA database is constantly updated, and can be accessed 24 hours a day, 7 days a week. AURA’s reliability is backed up by Snooper, one of the most respected and trusted satellite navigation and speed camera location manufacturers. Snooper has won dozens of awards for innovation and product performance and has been establised since 1979. Choose from three easy payment methods. Payments by Futurepay automatic payment system by credit or debit card. All payment packages provide unlimited access to the AURA Worldwide speed trap database!